Are your fire doors up to code? According to the National Fire Code NFPA 80 15-2.4.3 "All horizontal or vertical sliding and rolling fire doors shall be inspected and test annually to check for proper operation and full closure." Proper operation of fire doors is critical to insure maximum protection of personnel and property. Overhead Door Company of Greensboro can conduct your annual fire door inspection and recertification's. Our qualified service technicians can perform these services for you in accordance with NFPA-80 fire door inspection requirements. Overhead Door Company of Greensboro uses a "verification of Fire Door drop Test" sticker that is fastened onto a visible location of the door to communicate that the door was tested and certified as well as when next test is due. The sticker and drop test certificate verifies that your fire door has received its annual inspection and has been tested by a qualified service technician. 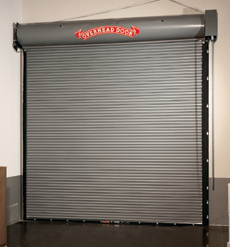 Overhead Door Company of Greensboro can certifiy, repair, or replace all types of rolling steel or sliding fire doors. Please call 336-373-1481 to speak with one of our Sales Associates to help with your fire door needs.